Cloudflare is a 3rd party service that adds extra security and benefits to your website. Hostek has partnered with Cloudflare to offer customers the benefits of Cloudflare. When you enable Cloudflare for your website, the website traffic is routed through Cloudflare’s intelligent global network. Free: Suitable for any site, but has significant limitations. Firewall: Recommended for image heavy sites. Premium Business: Recommend for eCommerce sites or heavy traffic sites. You can order this product like any other optional add-on product from the Billing Control Panel. You will need to activate the product in order to use it. 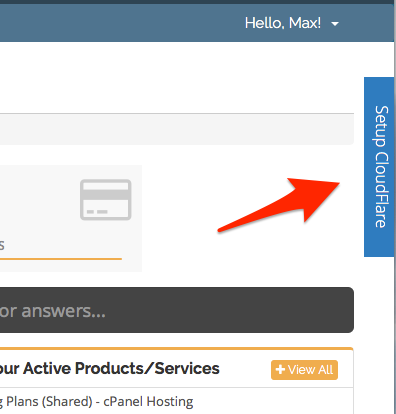 Once you have setup the Cloudflare product per their instructions, which will be sent to you upon order completion, you will be able to activate your Cloudflare product in the Billing Control Panel. To activate the Cloudflare Product, please follow the steps below. Next, you will be given the Cloudflare name servers you will need to point your domain to. It may take some time for your name server change to fully propagate. Login to https://Cloudflare.com/login to finalize activation.